After seven years of strong house price rises, Estonia's housing market is now cooling - mainly due to rising mortgage rates, as well as slowing economic growth. In Tallinn, Estonia's capital, the average price of apartments increased 4.31% (0.73 inflation-adjusted), the slowest growth in the past nine quarters. In Parnu City, the country's summer capital, located in the southwestern, apartment prices surged by 15.51% (11.55% inflation-adjusted), from annual rises of 9.96% in Q2 2018, 11.55% in Q1 2018, 12.51% in Q4 2017 and 0.1% in Q3 2017. Estonia's economy grew by about 3.5% in 2018, a slowdown from last year's expansion of 4.9%, according to the European Commission. The economy is expected to slow further, with projected GDP growth of 2.7% this year and 2.4% in 2020. Rental Income: Nonresident individuals are liable to pay 21% withholding tax on their gross income. No deductions and personal allowances are given. Withholding taxes are final taxes, so the non-resident has no obligation to file tax returns. Capital Gains: Capital gains from the sale of immovable property are aggregated with other income and taxed also at 21%. Inheritance: There are no inheritance taxes in Estonia. Residents: Residents are taxed on their worldwide income at a flat rate of 21%. The previously announced income tax rate reductions have been cancelled. Total transaction costs are between 2.57% and 5.59%. The main cost is the realtor’s fee, which varies between 2% to 4% depending on the size of the apartment. All costs are paid by the buyer. 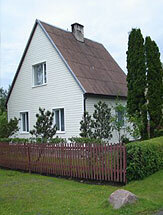 Estonian rental market practice is pro-tenant. Rents: ‘Luxury’ housing category is free from rent control. Other housing is subject to a prohibition on “excessive rents” (Law of Obligations S301). The landlord can ask for up to three months’ deposit. Tenant Security: Contract periods can be freely agreed between landlord and tenant, but there are dangers - upon expiry of a specified term lease, the tenant may demand that the contract be extended for up to three years, and in fact the tenant can demand repeated extensions. In addition, unless care is taken, specified term contracts can default to ‘unspecified term contracts,’ in which tenant eviction is difficult.